Sports Training such as Soccer, Football, Basketball, Lacrosse, Hockey and others. High Intensity Interval Training to Boost Cardio. Physical Therapy for injury cover. 4 Pegs to prevent Ladder from sliding or tangling. 1 Heavy Duty Nylon Bag to carry and store your Agility Ladder set. Add our agility ladder to your cart today and take the next step to an active lifestyle! ✅EASY TO CARRY AND STORE- This sports kit is also equipped with carrying bag, making it easy to take all of your agility gear with you wherever you go! 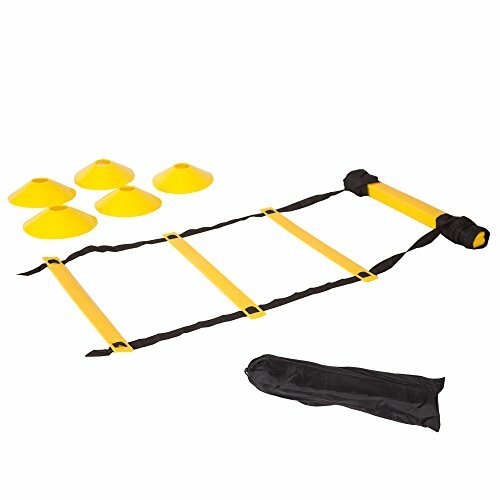 Indoor or outdoor training, our agility ladder is perfect for any kind of drills and skill sharpening. If you have any questions about this product by VRStore, contact us by completing and submitting the form below. If you are looking for a specif part number, please include it with your message.